A leading Sherlock Holmes expert died after being garrotted with a shoelace, an inquest has heard. Richard Lancelyn Green, 50, from Kensington, died from asphyxiation, Westminster Coroner's Court was told. Coroner Dr Paul Knapman recorded an open verdict and said the ex-chairman of the Sherlock Holmes Society of London suffered a "very unusual death". 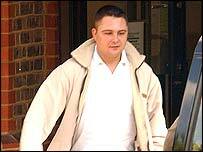 Mr Lancelyn Green was paranoid people were trying to smear his name and plot against him, the inquest was told. 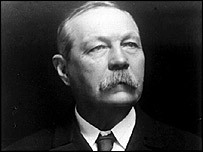 Mr Lancelyn Green, who co-edited a book about the Sherlock Holmes creator Sir Arthur Conan Doyle, had strong concerns about the planned auction of the author's papers, the inquest heard. The court was told he thought "someone in America" was preparing to dirty his name and he was becoming increasingly obsessed with the Conan Doyle legacy and the impending sale. The death has provoked more rumours about the so-called "curse of Conan Doyle" - several people connected with the Sherlock Holmes author have died unexpectedly early or have faced legal battles over the family archives. The coroner said: "There are many comments in this case in favour of suicide. He was acting strangely and he seemed to be scared and there is no evidence of violence. "I am perfectly content to say that suicide is the most likely possibility but we have no note and it's a very unusual way of killing yourself to put a lace, which must hurt, around the neck and continue to twist it. "The second possibility is unusual behaviour - often some form of deviant sexual behaviour. There is nothing that actually points to this form of death. "As for murder, there is not much in the way of direct evidence. "It's an unusual form of death that can be done by others. We do have interesting messages from him about the paranoia he was feeling but it is assumed by all to be without much foundation." Mr Lancelyn Green's sister, Priscilla, told the inquest she had become worried about her brother in the week before his death after a string of bizarre conversations. "It was clear he was very concerned about the upcoming Sherlock Holmes sale," she said. "This was Richard's life - Conan Doyle. It seemed that something about this sale was worrying him enormously and I tried to get him to explain to me what it was. "He made comments about his own reputation, about the possibility of his name being in the papers, about people behaving in a way he did not expect them to and doing things he did not expect them to." He had sent here a strange note with three names and their telephone numbers on it which had seemed to Ms Lancelyn Green "to be the beginning of a thriller novel". Police found Mr Lancelyn Green's body after his sister could reach no reply from his London house. The last known person to see the Holmes expert alive was his former boyfriend, care worker Lawrence Keen, from Roehampton. They had been out for dinner the night before Mr Lancelyn Green's body was found and Mr Keen said his friend had been "quite depressed". "He asked me to go in the garden because he thought the flat was bugged," Mr Keen told the inquest. "His mind was not its normal self and he was telling me someone in America was trying to hunt him down in the Sherlock Holmes Society."